Right-click on any of the column headers in the folder window, for example “Name,” “Date modified,” etc. How exciting! This is a mashup of tips I culled from various forums, and works for all countable files on Windows 7. If anyone has a procedure for other Windows versions or for Mac, feel free to share it. Wow – this is very cool, Corinne; thanks for sharing. Great tip! I (still) use Windows XP and the word count isn’t one of the options there. It doesn’t work for Windows 8! It does work for Windows 8. Shame it doesn’t work for OpenOffice documents though. This doesn’t count words. It counts white spaces between text strings. And that is a rather key difference when you deal with languages that don’t use spaces like most Western languages. A strange failure for a supposedly international OS. Yes, I am truly a nerd because that made my day (possibly my week), thank you! Please don’t trust this as being in any way useful. The word counts are wildly inaccurate. One file I just tested showed 277 words in Explorer and 451 in Word, for instance. I would strongly advise you to do your own tests and consider withdrawing this advice. Thanks Marc! I do agree that it’s a “use at your own risk” step, but for the files I counted, the word counts were the same in Explorer and Word. First of all, thank you for sharing, but under Windows 7, it worked with 1 document out of 5 tested, the word count within MS Word seems to be different from the one showed in the directory. Any ideas why? Great tip, thanks Corinne! I confirm it does work in Windows 8. Great tip! Recently I’ve got exactly the same situation – I had to quickly calculate how much time I will need to translate a pack of Word files. After a quick search, I downloaded a small app “Count Anything” and it worked very well. It specifies the number of words, characters, characters without spaces, numer of Asian and Non Asian characters. Stephen, apart from having a drag and drop interface, it is also able to calculate the number of words in a PDF file. What I do when I need to know how many words there are in a large number of files quickly is import them all into MemoQ and run a word count. It is very fast (I normally have MemoQ open all the time anyway) and of course it also shows you how many repetitions there are too. This is great to get a rough idea of a word count despite it not being the same as Word’s own count (as others have mentioned). View tab>Options>Change Folder and Search Options. Click the view tab and enable “Apply to folders”. OK. I recommend AnyCount because it has an option to include headers and footers (sadly missing in Word itself), and, of course, a total word count for a batch of files. Thanks! This is a great piece of advice but I found that the word counts given this way are not 100% accurate but close to the actual word count of the files. Figured out a way to make the word count in the column accurate. Before your last save, go to the review tab and click the word count button. Then save the document. 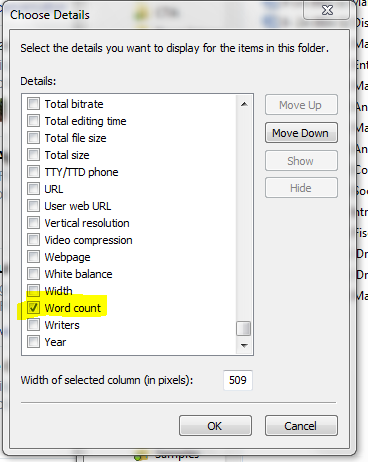 After that, the word count in explorer is the same as in the document. It works ! Thank you dbvirago, you have saved my day ! Thansk for this! Great, easy solution. You just saved hours from my life. THANK YOU! I am currently putting my translation log together and came up with a bunch of word files in one folder. I googled it and your tip appeared first in the results. AMAZING tip, thank you Corinne! Tks!!! Was a helpful tip! Thank you for the share. However, its showing the wrong total word count for the files. The file is 852 words but its showing 747. I deleted the headings and the title to check if it wasn’t counting them, but to no avail. does anyone know how to do this in windows 10? Thanks, Clare. I haven’t tried it in Windows 10, but perhaps someone else has? Hmm. That would be one for MS support…sorry to hear about that! 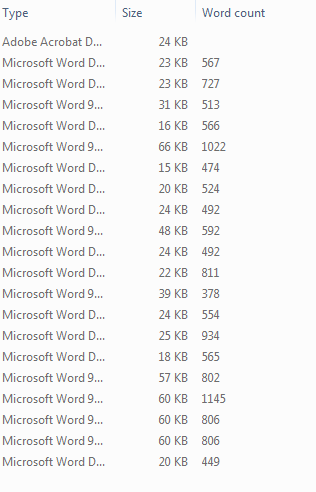 Had the same problem with Windows 10 not showing the folder word count, so I opened the folder and checked word count for all the documents and it came up with numbers beside each file; however, they were incorrect according to the files I had already opened and obtained word counts for. Clearly not a useful tool in this context. As someone has already mentioned it, please don’t use those wordcounts. It’s easy to demonstrate that they are wrong with a new Word document.